One common difficulty about living with an invisible illness that the Foundation often hears from Sjogren's patients is not feeling like you are being heard. With a presentation titled, "Can you hear me now?" 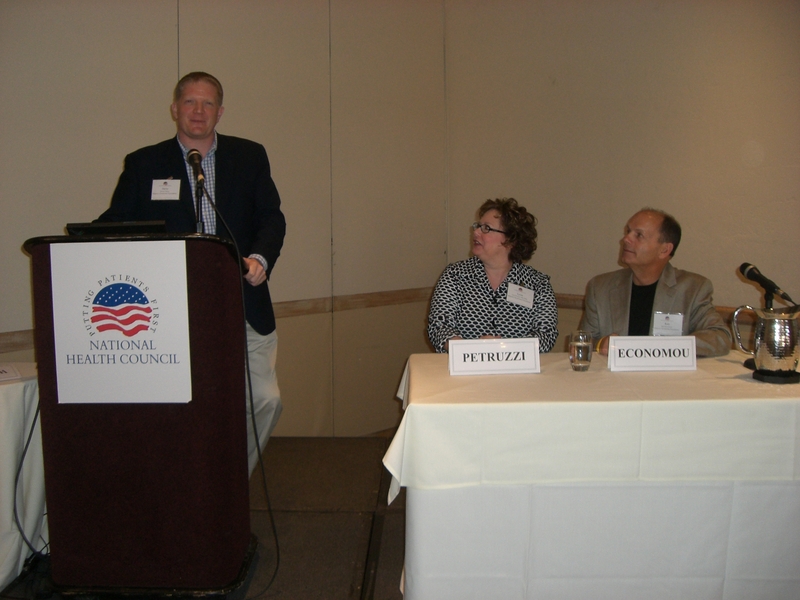 Steven Taylor, SSF CEO, Lynn Petruzzi, RN, Board of Directors- Chairman, and Ken Economou, Board of Directors member, presented the Foundation's new breakthrough goal “50 in 5” at the National Health Council’s 25th Annual Voluntary Leadership Conference. The annual conference that took place early in February is centered on health organizations sharing issues concerned to the patient advocacy community. Taylor, Petruzzi and Economou illustrated the step by step process that the SSF took to develop “50 in 5". They reviewed how the process began in 2010 with the Board of Directors recognizing the need for a breakthrough goal and the establishment of a task force to determine the new goal. Once approved, the setting of short and long term priorities needed to make the goal successful began. When presenting how the goal itself was established, Taylor stressed that the starting point was asking the question, “What would do you, if you knew you could not fail?” Two years later, the SSF proudly announced a loud and clear goal of “50 in 5” to change the face of Sjögren’s. The more we share about Sjögren’s, the more we will be heard. Don't forget to take time and share about Sjögren’s with the people in your life. Together we can make Sjögren's a household name- "50 in 5" here we come!